Ledco Signmaster 44" Roll Laminator has a Heatable Top Roller and includes Stand, Casters, Bottom Feed Roll & Foot Switch in 110 or 220 volt, and now with 2 year warranty. 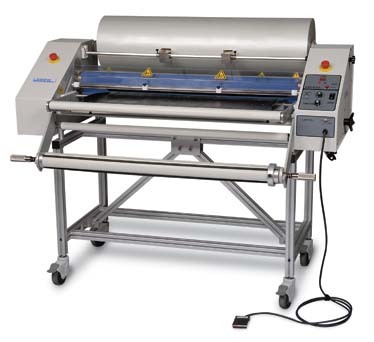 The Ledco Signmater 44" roll laminator combines the features of the XL44 hot pouch laminating machine with the Econocraft Cold Pre-Masking Tape Applicator cold ( pressure sensitive PSA ) roll laminator and has the ability to set the roller gap for up to 1/2" thick materials. This automates the application of pressure sensitive adhesive ( PSA ), transfer tapes, pressure sensitive laminates, thermal and p/s mounting boards, mounting boards with overlaminates and thermal laminating pouches.